Covered in multimedia lecture #1870. 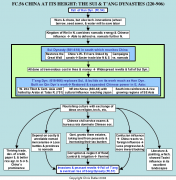 The fall of the Han Dynasty brought in a period of political anarchy known as the Six Dynasties Period. During this time, China was divided into three main kingdoms: Wei in the north where wheat and millet were grown and nomadic pressure was most intense, Shu Han in the west, and Wu in the rice growing regions of the south-east where many Chinese fled to escape the chaos in the north. The kingdom of Wei, which was situated between other nomads in the north and the Chinese in the south, was the first kingdom to successfully combine nomadic culture and Chinese influence. As a result, it was more organized than its nomadic neighbors while still keeping its nomadic energy, making it able to protect Chinese civilization in the south from the wilder nomads in the north. In addition, there were several technological innovations to compensate for labor shortages at this time: the wheel barrow, watermill, and a primitive seed-sower, all of which allowed Chinese culture to prosper more than the Germanic heirs of Rome were able to at this time in Western Europe. After several centuries of various dynasties competing for power, the Sui Dynasty reunited China. Much as the Qin Dynasty had laid the foundations for the Han Dynasty's greatness, the Sui Dynasty, despite the shortness of its reign, laid the foundations for the T'ang Dynasty's accomplishments through several endeavors. The Sui restored the Great Wall and mounted a number of huge expeditions against the northern nomads. They helped restore foreign trade, especially along the Silk Road. Likewise, they restored internal trade by connecting China's main rivers, which all run from west to east, with a north-south channel known as the Grand Canal. As a result, trade and travel between North and South China became much easier. Unfortunately, much as with the Qin Dynasty, these military expeditions and building projects involved a tremendous cost in lives and money. This triggered widespread revolts and the overthrow of the Sui Dynasty by a new dynasty, the T'ang, which would take Chinese civilization and imperial power to new heights. The T’ang were a military family from the wild northwest frontier and were especially skilled in the use of cavalry. The T'ang, themselves devoted horsemen, bred thousands of horses for their cavalry and imported polo from Persia, which even ladies from court played. Using their cavalry along with large numbers of allied nomadic cavalry and peasant infantry, the T'ang could deal with the Northern nomads and expand Chinese rule in several directions. After stubborn resistance, they conquered Korea in 668 and saw Chinese culture take deeper root in Japan. The T'ang also conquered North Vietnam, then known as Annan (modern Annam), meaning "pacify the South". They drove westward against Turkish tribes in Central Asia, established their power and influence in Tibet, Afghanistan, and India. In 661, Chinese forces even briefly restored the last Sassanid Persian ruler, Peroz, against the rising tide of Arab Muslim conquest. When the Persian king was finally overthrown for good, he found refuge in the Chinese court. Later, the Arabs would defeat a Chinese army at the Talas River in 751 and bring T'ang expansion to a halt. The unprecedented foreign influences that empire brought into T'ang China were welcomed with a new open-mindedness. Foreign fashions, music, cuisine, art, and religious influences from Central Asia, India, and Persia found favor at the court in China's capital, Ch'ang-an. Islam, Judaism, and Zoroastrianism all found their way to China, while Nestorian Christians, who were branded heretics and exiled by Rome in the fifth century, gained converts across Central Asia and were granted toleration in China as well. Later on, religious persecution (841-45) would eliminate Christianity, although the other religions would survive. Buddhism especially became absorbed into the fabric of Chinese religions, assuming a place alongside Taoism and Confucianism as one of the Three Doctrines which complemented one another rather than acting as competition against each other, as happened between Judaism, Christianity and Islam further west. Cultural influence worked both ways, however, as Chinese culture and technology spread to Korea, Japan, and even the tribes in Central Asia. One example of this influence was the spread of rag paper, which was invented, in the early Christian era. Most likely it reached the Muslim world as a result of the Battle of the Talas River in 751, when the victorious Arabs captured Chinese technicians skilled in its manufacture. Eventually, it would spread to Western Europe where it would be combined with another Chinese invention, block printing to create the printing press, one of the most dynamic and important inventions in history. While it is a European invention, its roots lie deep within Chinese history. Drawing upon these foreign influences and combining them with its own dynamic energy, Chinese culture prospered and flourished under the T'ang Dynasty in three areas: the economy, government, and culture. China's economy prospered largely through trade that thrived both within China and with the outside world. Foreign trade prospered, especially along the Silk Road that maintained commerce and contact with other cultures further west. Although trade certainly thrived, little is known about it, since so much was controlled as government monopolies (e.g., salt, wine, iron, and tea) or interpreted as "tribute" from foreign lands and reciprocal "gifts" going back out. China’s internal prosperity was especially reflected in its cities, which were the largest and most populous in the world. Foremost among these cities was the capital, Ch'ang-an with a population of some 2,000,000 people. It was laid out in a rectangular grid five miles wide by six miles long and facing the cardinal directions in accordance with the Chinese concept of the cosmic plan. One of these monopolies had a profound influence on the history of finance. In the early 800's, merchants selling tea to the government received government notes worth the hard cash value of the tea. These exchange notes, known as "flying money," proved to be popular, since they eliminated the need for carrying heavy coins. The use of credit slips soon spread among Chinese merchants and moneychangers and eventually westward to the Arab world, where they were known as sakk, and eventually to Western Europe where the term sakk became check. Meanwhile, in 1024, the Chinese government would expand the use of credit slips by issuing the first true paper currency in history. Chinese agriculture also prospered under the T'ang Dynasty. For one thing, careful censuses and an equitable system of distributing land and the tax burden among the peasants strived to ensure their prosperity. Second, the system of canals connecting China's rivers meant that relief could be brought to famine stricken areas. Finally, agriculture saw particular progress in the South where new strains of rice and better farming techniques dramatically increased crop yields with resulting population growth. Eventually, under the next major dynasty, the Song, the balance of power and population would shift from the North, where Chinese civilization first evolved, to the South. Power and prosperity also brought a flowering of the arts in China. Buddhism, coming from India, had an especially profound influence on Chinese sculpture. However, it was in poetry and painting that one could especially see the Chinese genius at work. Both poetry and painting showed a typically Taoist love of nature through their portrayals of flowers, mountains, rivers, and clouds, but rarely the sea, since the Chinese were traditionally a land loving people. Another development was the further improvement of the civil service exam system and the emergence of the official gentry who had passed these exams as the main bureaucrats of China. This system had been used by the Han Dynasty, but only in conjunction with the older patronage system favoring nobles and political connections. Now the exam alone determined who attained bureaucratic positions in China. However, since education was expensive, only the rich could afford to train one son per family to take the exam. As a result, the officials became a virtually hereditary class. The training and exam stressed Confucianist classics more than mathematics and law, the purpose being to cultivate wisdom and morality in China's officials. In the centuries to come, China's stability and resilience would largely be based on these official gentry. In 690, the official gentry's fortunes rose further when the only woman to rule China in her own right, the empress Wu, seized power. Her fear of the T'ang military aristocracy in the Northwest probably spurred her to complete the transformation of the civil service in order to favor a completely civilian class of bureaucrats whose status was based on merit. However, their rise to power meant a corresponding decline of the military nobles, which eventually would weaken China's defenses and help lead to the decline of the T'ang Dynasty. Several factors led to the fall of the T'ang Dynasty, three of them related to the triumph of the official gentry and the civil service system. For one thing, the government granted the gentry estates, thus taking land from the peasants and increasing their tax burden. This, along with a series of famines partly caused by government corruption and neglect of flood control and irrigation systems, triggered peasant revolts. Secondly, the gentry's dominance of the government caused the emperors to ignore the army and start relying on nomadic mercenaries who were more expensive and much less reliable than native recruits. As a result, T'ang armies suffered a number of defeats, notably at the Talas River against the Arabs in 751, making Islam rather than Buddhism the dominant religion in Central Asia. The weakened army invited invasions from without and revolts from within. Finally, the rise of the official gentry unleashed a Confucianist reaction against foreign influences in China. From now on, China would be more inward looking, sometimes blocking out new ideas that could have been of great use.